Instructions: Card size is 7 1/2 x 5 1/2" with a 1/4" depth. Cut a piece of cream cardstock at 5 1/2 x 7 1/2". Cut a second piece of cream cardstock at 5 1/2 x 8 1/2" score this on the short side on 7 1/2 and 7 3/4. Adhere the first piece of cardstock onto the end flap of the second cardstock. This completes your card base. Take paper from the collection with a green background and cut to 5 1/4 x 7 1/4", ink the edges with Coffee ink. Cut red cardstock to 5 x 7" and glue this on the green paper. Cut a piece from the paper collection to 4 7/8 x 6 7/8". Ink the edges with Coffee ink and glue it on the red cardstock. Add glue to the birds and then sprinkle some Glass Glitter, tap off and let dry. Using the border from the Album Tags and Accent dies and red cardstock, die cut the border twice, lengthwise. Take the remaining paper, and adhere it behind the original border, to create a double-sided border. Adhere this to your decorative paper and fold the edges behind it. Adhere this panel to the card base. Adhere the bling on the roll along the seam of your red border. Die cut a ticket from the paper. Ink the edges with Coffee ink and adhere using 3D foam. Using Vermillion ink and white cardstock, stamp 12 of the smallest tulips, color them on the front and back with Lady Bug ink. Die cut with coordinating dies. 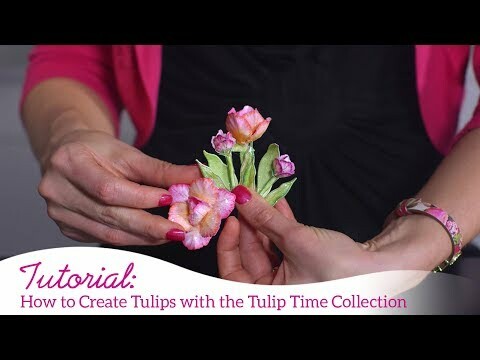 Now stamp the tulip leaves with Fern Green ink and color them with Leaf Green. Die cut with the coordinating die. Now place all the die cuts in the 3D mold, spray them lightly with water, put the lid on and run it through the machine. Adhere 2 flowers offset on top of each other, make a hole in the center and pull 1 stamen through it. Take your florist tape and run it over the wire of the stamens. Glue the leaves on the stamens. Using Fern Green ink and white cardstock, stamp the tulip vase fillers and color them with Leaf Green ink. Die cut with the coordinating dies, on the tiny Hyacinths you can glue some prills and let this dry. Make a nice bouquet with all the flowers and fillers and place this on the top of the card. Add moss, a bow made from seam binding ribbon and a charm to finish it. To see all the fun things on the inside of this card, please visit my blog.